I like Spider-Man but I always found Venom to be only okay. Maybe as I was a Spider-Man fan in the 90s, so there was plenty of opportunities to see Venom that I never grew to miss the character. In the previous issue, we saw (apparently) Eddie Brock ruin his career with the Sin-Eater fiasco. Which if you haven’t read Peter David and Rich Buckler’s excellent Death of Jean DeWolfe, do so as soon as possible! Slight spoilers, at one point, there is the real Sin-Eater and a guy who claimed he was the Sin-Eater. (Everytime I type Sin-Eater, I keep typing Sin-Easter) Eddie has the unfortunate experience of interviewing the fake one and didn’t do enough fact checking that embarrassed the newspaper and he was ruined. 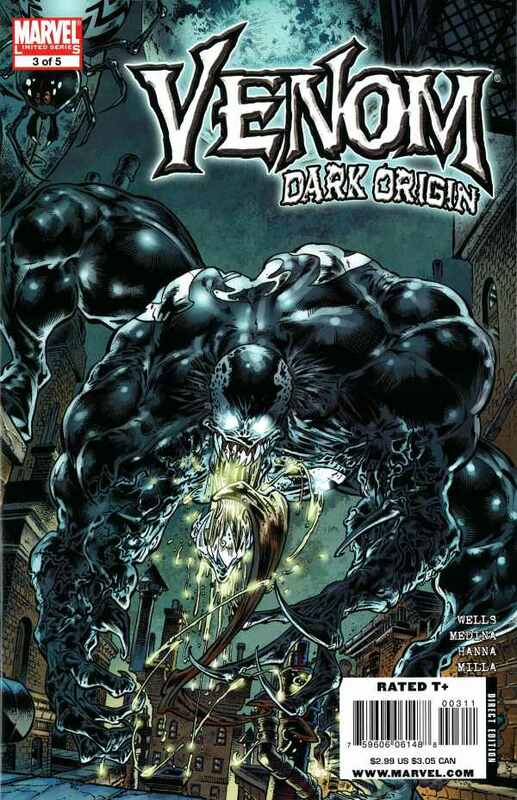 Essentially, issue three, is the issue that anyone who knows Venom, or saw Spider-Man 3, is familiar with. Eddie Brock is in the church, contemplating suicide. He looks up to the heavens, and for his thanks, gets a symbiote in his face and eyes. The symbiote, of course, is the same one from Secret Wars, otherwise known as Spider-Man’s black costume. Lockheed’s involvement in Secret Wars, keeps paying off! See him on the bottom right corner? Looks like he is fighting the Lizard there! With Eddie’s screaming of these new memories, and for being attacked by black goo, the priest and cops start coming into the church. The police take a beating. I really like the image of a body builder in the black costume. We haven’t gotten the classic Venom with the mouth and the tongue, he still has the close face mask like Spider-Man do. Here are some ads here. 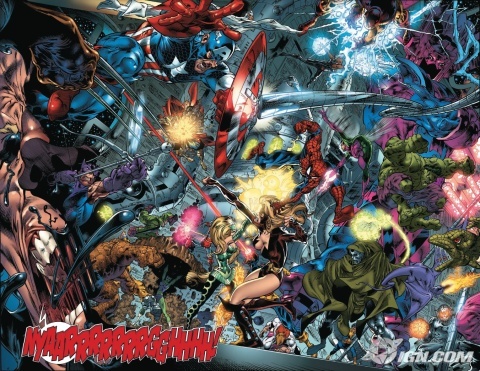 Like the two page embracechange.org website (that sadly doesn’t work any longer) to promote Secret Invasion. An ad for Astonishing X-Men Ghost Boxes part one of two, the second issue is the one to buy. But just barely. Also, Marvel Zombies 3 was about to come out. As well as Spider-Man Noir – which I haven’t read but he was my favorite sections of Spider-Man : Shattered Dimensions. Back to the issue. Venom has the priest forgive him for his recent actions. Eddie quickly learns that the symbiote costume can change its appearances and he now has a fancy suit. He signs his divorce papers to Ann with the ink from the symbiote. Ann looks quite different here than she does in her first appearance in Amazing Spider-Man 375. Maybe she is suppose to very very tan here. Maybe? Eddie, as Venom, looks himself in the mirror and starts laughing at the possibly of finally being able to get his revenge on Spider-Man. His laughter is so much that it makes the symbiote laugh as well as we get the famous Venom with Teeth and Tongue face that we all know from Amazing Spider-Man 300 and on. It took this series three issues to finally unite Eddie and the symbiote, I wonder what the next two issues do as pretty much, this is the only issue you need to know about the two characters.